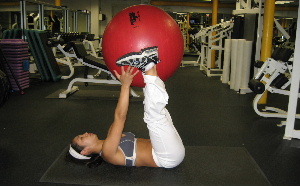 Complete your ab workout with a good swiss ball abdominal exercise. This is also a good lower stomach exercise. This is one of my client's favorite ab exercises, partly because she really feels her abs burning and partly because we both laugh so much when she's doing it--she has a hard time keeping the ball between her legs because she's only 4'6". This exercise takes a little coordination, but try it and include it in your workout if you like it. Starting Position: Begin lying on your back, with the ball in your hands over your head. Form: Bring your arm and feet together and pass the ball from your hands to your feet. Lower your feet towards the ground and let your arms go back over your head. Then, lift the ball back up to your hands and continue exchanging the ball between your hands and your feet. Perform 10-30 repetitions. Each time you move to the center is 1 repetition. Personal Training Tips: Your arms and legs should move together. Both meet in the center, and then both move away from your center. Keep your back stabilized and in a good position throughout the exercise. Pay close attention to the position of your back when you lower your legs with the ball. If you feel your back arching, don't lower your legs as far. For added intensity, you can add a crunch from the upper body when you put the ball between your legs. This is a fun abdominal exercise that can help to mix things up in your ab workout. 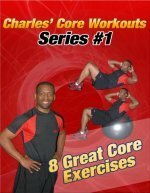 Here are some more abdominal exercises with the ball. Or check out the ab workouts on this site. Have Fun with your Ab Workout and Keep Working At it!